Rangjung Yeshe Gomde Russia–Ukraine is a center that unites practitioners and students of Vajrayana Buddhism in Russia and Ukraine. We aspire to create perfect environment for studying and preserving Buddhist culture, philosophy, practicing meditation as well as doing individual and group retreats. We follow profound traditions of Kagyu and Nyingma schools of Tibetan Buddhism and particularly Chokling Tersar lineage of great masters. We support transmission and continuation of living knowledge in accordance with the foundational teachings of Buddha Shakyamuni and work towards dissemination of universal wisdom and compassion. Our root teacher is Chökyi Nyima Rinpoche, the abbot of Ka-Nying Shedrub Ling Monastery (Kathmandu, Nepal). The first visit of Rinpoche to Russia and the first retreat in Moscow took place in 1994. In 2012, Rinpoche visited Kiev and gave the teachings to the Ukrainian students. Thanks to spiritual direction and valuable support of Chökyi Nyima Rinpoche, Lama Sonam Dorje and Lama Tenzin Sangpo, Rangjung Yeshe Gomde Russia–Ukraine has been formed. Our sangha meets regularly for weekly collective practices in Moscow, St. Petersburg, Chelyabinsk, Nizhniy Novgorod as well as in Kiev, Kharkov, Odessa and Lviv. Several times a year there are retreats of various duration. Rangjung Yeshe Gomde Russia–Ukraine organizes teachings of qualified masters from Nepal, Tibet and India who generously give Vajrayana teachings and pith instructions on Dzogchen and Mahamudra. Our main focus is application of meditation and the guidance of enlightened masters into practice and integration of spiritual experience in everyday life. As a result of our spiritual mandala’s growth and the efforts of many people, Buddhas and Bodhisattvas, the Centre of Tibetan culture and meditation Thubten Ling was established. 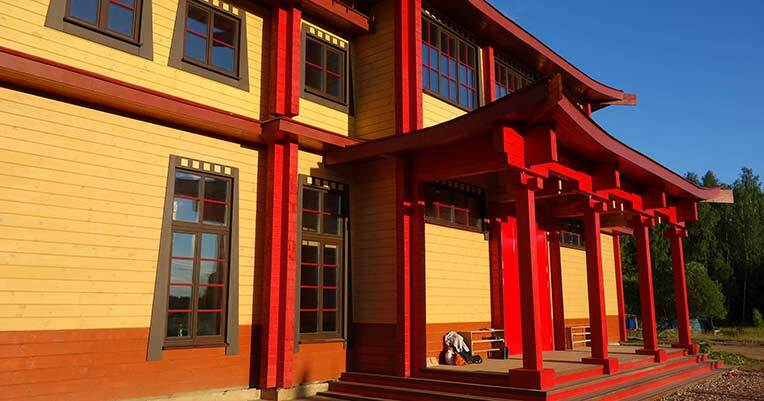 The building is constructed of wood designed as the classic Tibetan temple. It is located in the peaceful and quite place 140 km away from Moscow and is an important center of Buddha’s teachings in the western part of Russia and Ukraine. In 2014, Chokyi Nyima Rinpoche ceremonially consecrated the Thupten Ling and held a retreat with his disciples within the walls of the new temple. Today the Thubten Ling welcomes anyone interested in Buddhist culture and meditation and allows practitioners to conduct individual and group sessions and organize seminars on classical Buddhist philosophy the year around. In order to share the knowledge Rangjung Yeshe Gomde Russia–Ukraine supports translation, publication and distribution of books on Buddhist philosophy, history and the teachings of Buddhism. Parts of the funds from sales are spent on the development of Buddhist communities, the construction and maintenance of the Thubten Ling and other charitable projects. Another activity of our sangha is construction of stupas in Russia and Ukraine, as well as in other countries for the dissemination and strengthening of dharma in the world. The purpose of this project is to build 108 Enlightenment Stupas in accordance with the classical Tibetan tradition. Today there are 12 stupas built in the Moscow region, St. Petersburg, Kiev, Kharkov, Zaporozhye and other places of the world. In 2016 it is planned to build a new stupa in Crimea. Rangjung Yeshe Gomde Russia–Ukraine is constantly evolving. In the future, we plan to create a complex training program for those interested in deeper learning of Buddhism. This program will allow students to get a comprehensive Buddhist education in Russian language. The study program will be based on the disciplines that are successfully taught in the Rangjung Yeshe Institute in Nepal.